Earlier this year I made the clean beauty switch and I haven’t look back! I’m happy to say 95% of the products I use are clean. Why clean beauty? Our skin and our bodies don’t need the fillers, chemicals, and seriously nasty stuff to be effective. The cleaner products truly make my skin look and feel incredible. Plus, I don’t have to feel bad when Harlee goes through my makeup drawer and starts testing them out! Indie Lee. I discovered Indie Lee’s Squaline Facial Oil earlier this year and I am OBSESSED! I use it every single night. 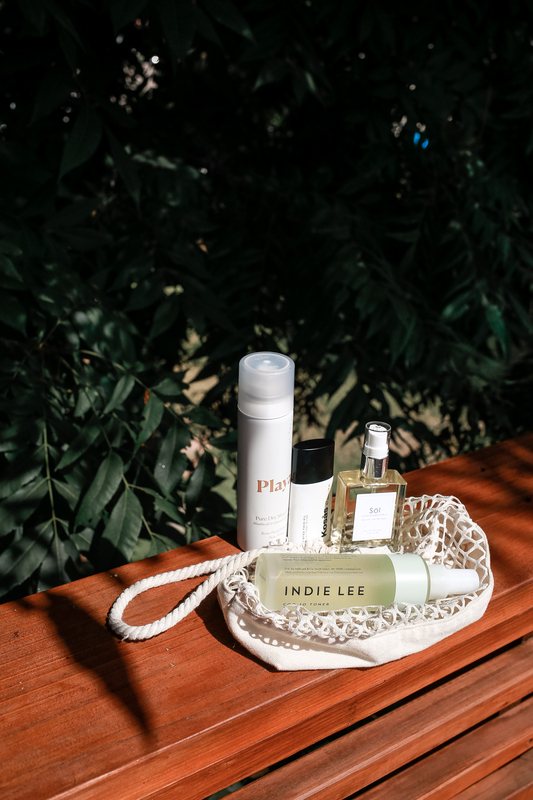 Since I loved the product so much, I tested out more products (sent to me by the Indie Lee team). The Brightening Cleanser is so good guys, so good. It has a jelly feel to it, takes off all of my makeup, and leaves my skin looking bright, soft, and hydrated. I had heard so many great things about the CoQ-10 Toner and it lives up to the hype. Similar to the oil, it balances out my skin and leaves it looking toned and radiant. Vive Sana. The skincare gods heard our prayers with this product, the Serum Crema. It’s a hydrating day cream, SPF, and potent serum so you protect and perfect your skin in one simple step. Epicuren. A new-to-me brand that I really liked. I tried out the Enzyme Concentrate which improved my skin tone and overall look of my skin. The Gemstone Oil is another favorite. It’s a lightweight body oil that I use nightly and wake up to super hydrated, smooth, and radiant skin. It has seriously boosted the summer tan I have. W3LL People. I love W3LL People for many reasons, one of them being I can shop the line at Whole Foods and Target – WIN! 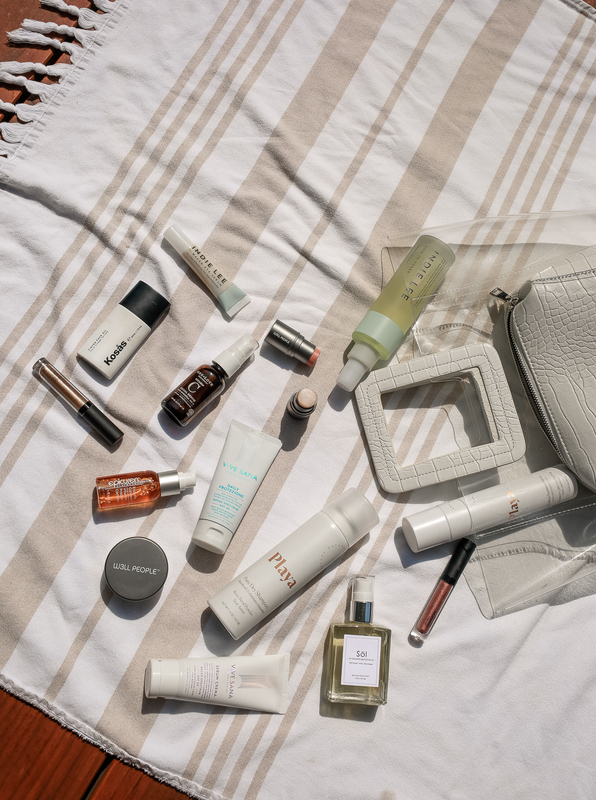 I’ve been using their bio tint moisturizer with SPF for a while now and it’s one of the go-to products in my arsenal. It hits all the checkboxes in my book. I’m also a fan of their nudist cream stick which I use on my cheeks, eyelids, and lips for a pretty and simple look. The brightening stick is another favorite since I use it on my cheeks and eyelids for a summer glow that lasts all year. Kosas. I’ve been a fan of the Kosas lipstick for a while now so when I saw they launched a tinted face oil, I ordered it as fast as I could. You guys, it. is. so. good. I never wear foundation and even when I put on a tinted moisturizer, it feels so heavy on my skin that I wash it off as soon as I get home. With this tinted face oil, I forget I’m wearing makeup and almost forget to wash it off at night. It’s so lightweight, my skin can breathe, and it provides just the right amount of coverage. Crop. This is another brand I tested for the first time and I love the bio metal eyeshadows which are super pigmented and saturated and last all day long. I normally skip eyeshadow since it smudges after a long day, but this one stays put. I also love the intense matte lipstick. You know your girl loves her bold lip and these are super pigmented, moisturizing and also last all day. Playa. When it comes to my hair, it starts and ends with Playa. I start with the everyday shampoo and supernatural conditioner. I use the endless summer spray to get my messy waves, while the dry shampoo helps me go an extra day!